New members were welcomed and introduced. Cake amnesty was announced by new Chairman. Both minutes from previous meeting as well as current agenda were read and approved by participating members. The treasurer have to give each floor the money (500 kr each floor) for the first quarter of the year – this wasn’t done on the May 1st. – The money are meant to be spent for furniture, new utilities and other stuff. Economy will be catched up on on the next meeting. We have received a summary of what’s going on in UBS bolig – There have been cases of subletting the room through Airbnb, which is against the rules. This can lead to immediate cancellation of the contract. The antenna upgrade was to separate channels in room and the kitchens. Erik will also look into the missing of Zulu and some noise on Tv2. Residents can tell Erik if they don’t have any channels at all in their room. When this is done, residents will be able to buy a box so they can individually pick and pay for channels they order. The elevator breaks down too often, and sometimes OTIS are slow to come fix it. Somebody was stuck for 2 hours. There’s another firm KONE which is cheaper and hopefully more reliable. Erik is working on changing to this firm and then it will be brought up for vote in a Resident council meeting. New door and its opening mechanism has been installed. It was proposed by Erik, fairly expensive, but residents are happy with the result. /Bar– the new speaker has been tested. They do work but there is still some wiring problem which needs to be solved. Members were concerned about the fact, that there are many members of the bar but they don’t help Steff Nielsen with the cleaning after the events. A new bar event will be announced soon. In a month they’ll have a meeting in the committee. Bar committee has 20 members. /Garden – 4000 kr for spending are supposed to be used. The trampoline in the garden is private and meant for children. /Complain – No complains. Please do complains. /Exercise – People do use the exercise rooms. The tennis net needs to be fixed. Erik is in charge of it and he will contact Filip Strycko. /Key – The garden committee is lacking the key from their storage room. Some members were concerned about large amount of people having CAA keys, which is not necessary. There are a lot of things (tools, equipments, games etc.) residents can borrow, they just do not know about that. Steff made a tour around the rooms residents or committees can use. /Games and fun – Games are allowed to be rented only at the bar launch (they were expensive, people tend to lose parts of the games). A Game night will be announced soon. In general the committees should try to include more people, in particular new residents of the dorm. Committees and floor representatives should introduce the possibilities to the people. Larger promotion of the committees would help. /Painting of the bar – not much had been done because of the past shutdown of the Council. Furniture in the bar room is worn down and needs to be changed. People will be invited for a meeting to make proposals about new furniture, painting and overall design of the bar and lounge. Using furniture second hand shop closeby was proposed. Ideally, changes should be made during the summer, as there will not be that many people. Anything should be thrown out without posting on facebook, so anybody who want can take it. The budget needs to be set, It will be brought on facebook group of committee. /New speakers in the bar – they are bought and installed. /Information video – People made small dorm introduction videos but it still needs adjustments and there is nobody who would want to do that. Theis from 5th floor will help editing the movies, if that is the only problem. Work on the leaflets have stopped. Filip is taking over the leaflet project. It will contain info about all the amenities and possibilities at the dorm, as many people don’t know about them. /NoThanksToAdvertising – Project for preventing spam mails in our mailboxes. Daniel has send emails to Post Danmark who hasn’t answered. Daniel will contact them again. /Resource saving project – New showerheads, laundry payment system and other measures has been taken to save resources at the dorm. Everything we can do with water has been done. The board and UBSbolig is looking into splitting the water bill for Horhus and Scandis. Also, if you loose your door/laundry/elevator chip, you need to ask Erik for a new one together with a password for activating its laundry function. You also need to ask Erik to transfer your old laundry account to the new chip. People are not receiving new laundry accounts when they move in. /Web page – Webpage looks nice, however, it still lacks translation and some minor fixes. Magnus from 8th is in charge of translation. Filip will poke him to finish it. Media room fixing project – In order to save money, Daniel, Janna and Simone will check all the equipment (speakers, cables, projectors) we have and report it to the Council. Idea behind the project is that there is a lot of speakers which we don’t know whether they work. Maybe we will not have to buy new ones for Movie nights. Rooftop garden – The goal of this project is to create the garden and chill area at the rooftop of the dormitory. 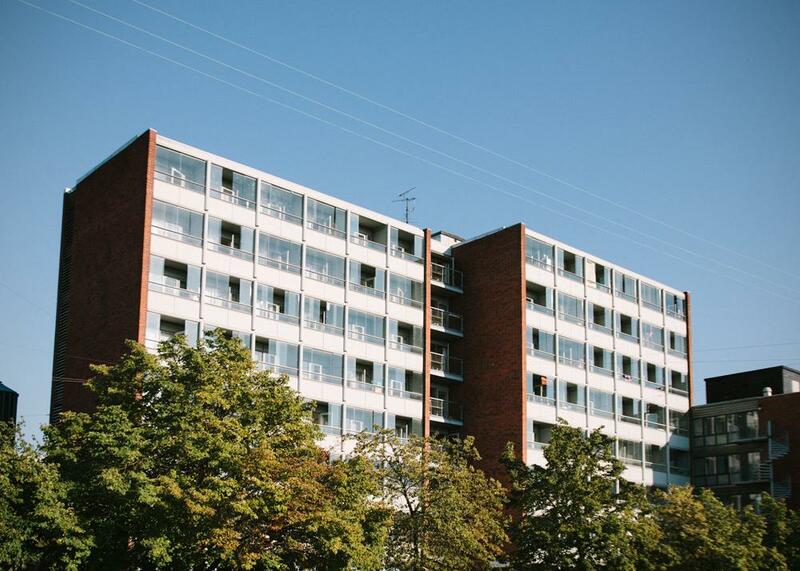 Project was proposed by Anette Danvad, but initiative came from Kasper Møberg Johansen. He will report new information at the next council meeting. Cherry tree in the garden could be harvested if all the cherries are not eaten by birds. Janna will put it on Facebook in case it is possible. We can make some dorm food/drinks afterwards. Council will try to organise next meeting in 27. week of July and will see if we can reach the quorum (it’s summer).